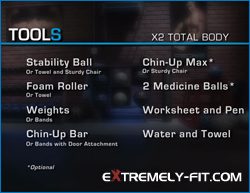 In this P90X2 review, we’re talking X2 Total Body. If you were a P90X One on One subscriber, you may think this will be somewhat like the 1 on 1 Total Body X. Having done both workouts, I might have recognized some of the moves, but for the most part this is all brand new material. This workout first time out is super fast paced. You’re learning new moves, trying to determine the proper weight, and to make it worse the P90X2 Worksheets from Beachbody are wrong. Not far off, but I essentially doubled my work this morning. I’ll explain more about that below. But to prevent you from getting confused, I corrected the worksheets, and made them available to you on my P90X2 Downloads page. Go grab them here. So far this week, I have completed X2 Core, Plyocide, Recovery + Mobility and now X2 Total Body This morning I was feeling a little run down, not terrible, but a “good” tired feeling. Of course once the workout started, it was off to the races. You may be feeling great at this point, or you may be feeling worse. We are all going to have our strengths and weaknesses during P90X2. You’ll excel at some moves, and struggle on others. To quote the ever popular P90X saying, “Do your best and forget the rest.” Just keep showing up, day after day. Keep pushing play. Struggle, push yourself, collapse as needed. Just don’t give up. P90X2 has some flexibility to it. You can stay in the Foundation phase for 3-6 weeks. Do what is best for you, and stay in each phase for as long as needed. Fitness is a life long journey. Accept that you are human, and that you are doing your best. My hat goes off to everyone that just shows up for the workout! Time, patience, and practice makes you better. Stay in the game! When you show up, you have already won. No excuses! 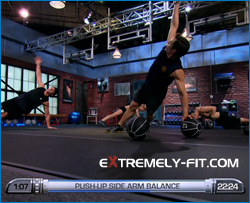 P90X2 Review – X2 Total Body. On Your Mark, Get Set, GO! This workout is essentially: a warm up, a stretch, a total body workout, and then a cool down and stretch. Piece of cake. But let me tell you this, from the minute the main workout starts, you are off to the races. Some of that is from just learning a new workout, and selecting the right weight, so I imagine that once you get familiar to the moves, and are tracking your progress on the worksheets, it will get better. This workout has two rounds. Each round has 12 moves, with a water break at the half way mark. Let’s break it down now and give you a more detailed look. First my heart rate details. I’m always curious to get my numbers after a workout. Total calories was 797! Crazy for a weight training workout. That’s an additional 150 calories over Plyocide. Max heart rate was 167, and the average was 138. The max is always interesting too, but the average is somewhat deceiving as that includes the warm-up, stretch, cool down also. This workout is approximately 62 minutes. The warm up is super familiar at this point. Using a balance ball or towel, you do the usual: Twist, Squat, Side Stretch, Alt Back Lunge, and Atlas. Warm up is about 4 minutes. Then on to foam rolling. I tell you this, I love the foam rolling. You only get about 4 minutes. I could have easily gone longer. Yesterday was Recovery + Mobility. An hour of stretching and foam rolling, and I still felt as though I could have done more with the foam roller! Next, and still warming up are more familiar moves at this point. Roller Sphinx, World’s Greatest Stretch, Inch Worm, Scorpion, and Groiners. This takes another 4-5 minutes. Now we jump, jump, jump into the cardio workout. But guess what, two new moves. Table and Scapular Retraction. New is good, maybe it just doesn’t take much to get me fired up. 🙂 . 12. Rocket Launcher Preacher Curl (right leg only)Water Break, approx. 1 min. ** Special Note: Now, let me throw in where my initial confusion came in, during my workout this morning. The Beachbody worksheets, reflect a right leg AND a left leg movement on exercises 4,5, and 6 above. In reality, you only use one leg or the other. So during this review, I carefully watched the video again, and Tony specifies which leg to use, which I have noted above. I then edited the worksheets to reflect the use of one leg only, thus eliminating the confusion. Below, you will notice in round 2, you use the opposite leg as you did in round one. I used both legs both rounds. YIKES. No wonders I was running a bit behind! The cool down and stretch is just under 9 minutes. Can you travel with this P90X2 workout? Yes. This workout can be easily modified to use while traveling. However, make certain you have the right bands, may need 2-3. Also make sure you have a door attachment. My thoughts on the P90X2 Equipment needed for this workout. You can easily get by with a towel, bands, and a band attachment. If you can use weights, chin up bar, stability ball, foam roller and medicine balls… even better. A quick note on weights. I invested in Power Blocks in 2007. I am using the same set right now, they are still in great shape, and I absolutely love them. Quick weight changes, perfect. Get some if you can! This was a recovery drink day! Almost 800 calories of non-stop action. it’s been about 4 hours since I finished this workout, and I’m starting to recovery nicely. The first hour or so I was just exhausted. If you like my reviews, please feel free to share them with others. maybe give me some love on Facebook. Visit our store for everything Beachbody. We have reduced shipping rates, and exclusive bonuses on several products. Check us out. We are an authorized distributor, and appreciate your business! As always, please feel free to contact me or comment below. If you have your own thoughts on p90X2, comment away. Good luck with P90X2! 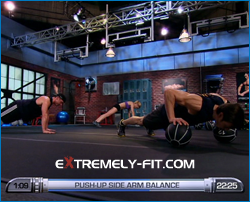 If you want to read another P90X2 Review, you can find them all by clicking here. Robert, how did this workout compare with the P90X Plus Total Body Plus workout? Excellent review!! They are both great workouts, but I like this one more. However, over time, rotating the two into your rotations will be beneficial to keep it different and fresh. Since they are both Total Body, it will be an easy substitute. P90X 1on1 has a Total Body thats good too. Hi Robert, I was just wondering how much weight should you use when using the dumbells because I also have the power locks and I was curious how to determine how much weight you use while doing the P90X2? Steve, it’s been a little while since I completed X2. But weight ranges will be different for everyone. I religiously track my workouts, so I recommend you doing the same. Write down your starting weight, keep great form, and then do the recommended amount of reps as suggested by Tony. If its a rep count or a timed set etc. Then write it down and indicate if your next set needs to be heavier or lighter. Than the next time you repeat the workout, adjust again accordingly. GL with X2, I loved that rotation.